Initially established as Mobil Support Unit Foxtrot in 1968 at the height of the Vietnam War, NRCS is the oldest Department of Defense organization operating in Singapore. 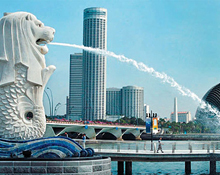 In July 1992 COMLOGWESTPAC was established in Singapore as logistics agent for 7th Fleet. COMLOGWESTPAC is the U.S. 7th Fleet's principal logistics agent and bilateral exercise coordinator for Southeast Asia.